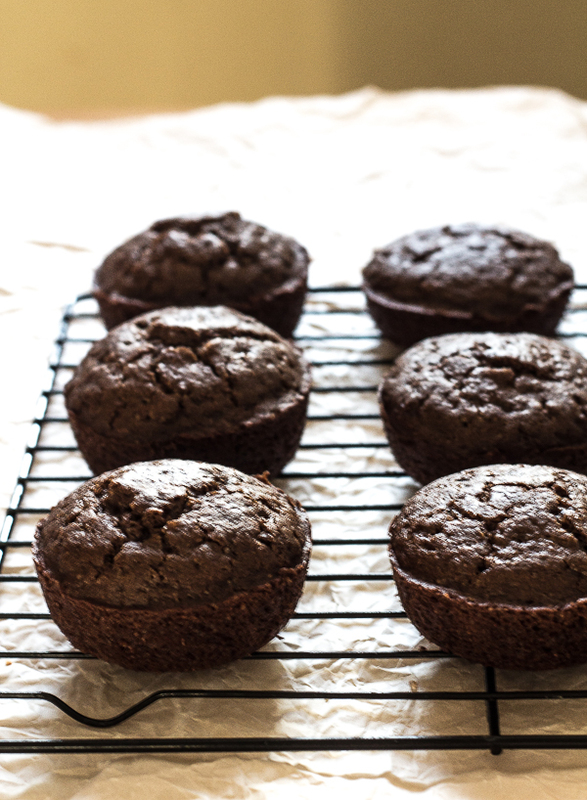 To all of my vegan, dairy-free, gluten-free buddies – HELLO – are you in for a treat! And this is for you too, who like me, is beginning to look at the healthier side of life. Because over there, the grass is much greener people. I mean everything is green; smoothies, salads, sauces, everything! Just kidding, it’s not all green just greener. You see, since before I started my 21-Day Vegan Challenge, I have searched high and low for recipes that still make your toes curl, your eyes roll back and your taste buds start to breakdance. You know, feel good food! Anyway, today my friends is a very special day because today, I brought a pound of strawberries home from the store and they were perfectly ripened sweet..and beautiful..and succulent and they were actually begging me to make something mind-blowing out of them. After some feedback from my Facebook friends and family (thanks Dorareen and Stephanie <–you Rock! 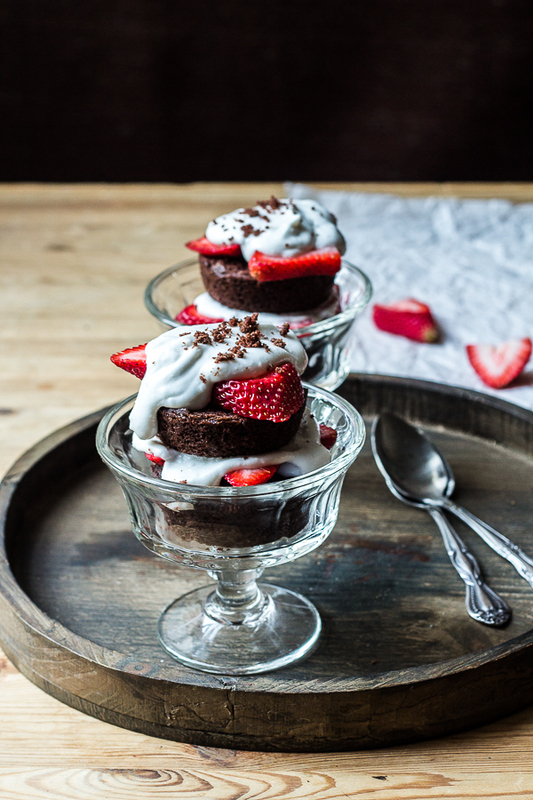 ), and thinking about how I can take this dessert to a whole new experience, I decided to make this Vegan Strawberry Chocolate Shortcake! It’s really the perfect summer dessert isn’t it? I mean, without even looking at a single photo of this beaut, you can just imagine your summer filled with beautiful layers of moist, delicious cake sandwiched by red, plump strawberries and some kind of delectably sweet topping. Word up! You can make it as a layer cake and then assemble or you can make them minis- like I did. But wait, what about the vegan part? The best part, friends, is that it’s vegan, gluten-free, dairy free and so easy to make. Try saying that fast 3 times! It’s the shortcake we all know and love but way lower in calories, fat, sugar intake and glammed up just a bit. This is fun for so many reasons, but primarily because I get to learn how to make an amazing dessert but with healthier ingredients. Plus, it makes me feel like I’m cheating when I’m not. Ha! Everybody wins in this one. 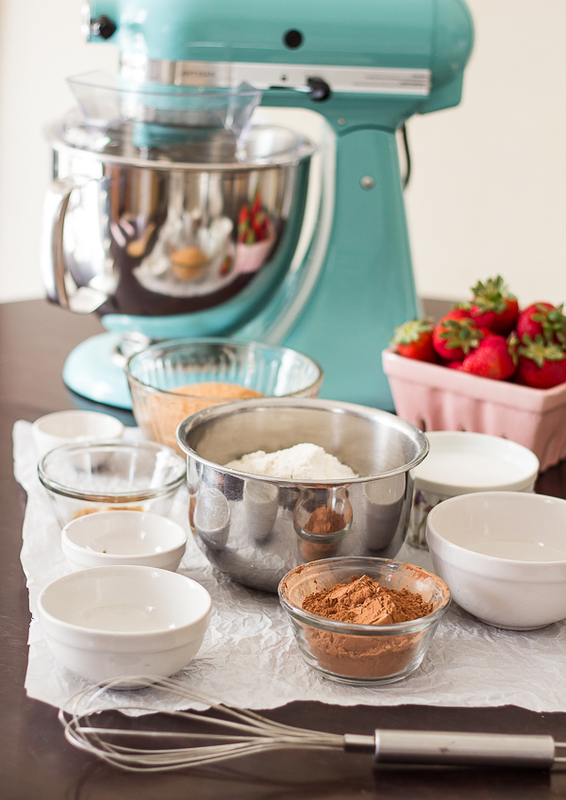 It all starts with a chocolate shortcake made from King Arthur’s gluten free flour blend containing, potato starch, tapioca starch and rice flour. 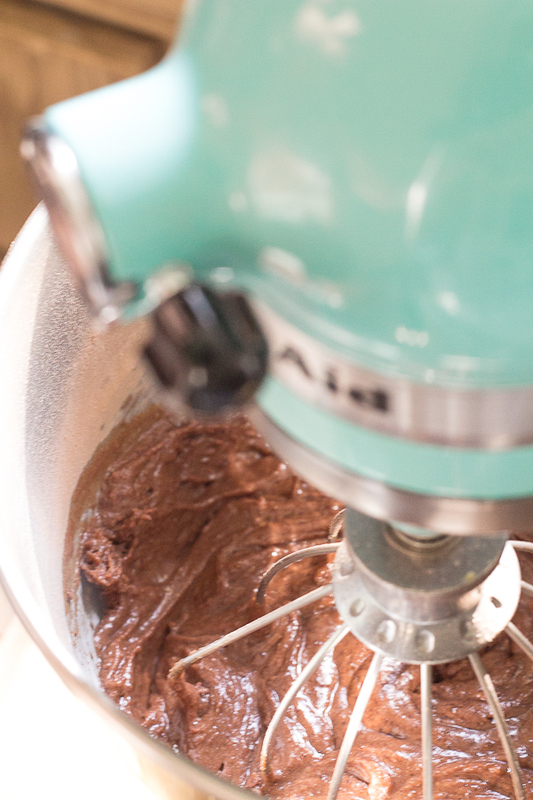 The flour, cocoa powder and all of the dry ingredients get sifted together in a bowl. Now for the wet ingredients: In a separate large mixing bowl, stir together the coconut milk, water and vinegar until it has completely curdled. Add the remaining ingredients (sugar, oil, vanilla extract) and whisk the flour mixture in slowly. Beat for one minute then divide the batter into 3 prepped cake pans lined with parchment paper sprayed with non-stick spray. Bake the chocolate shortcake for 20 minutes or until a toothpick inserted comes out clean and cool in cooling rack for 10 minutes. While the cakes are cooling, open the cans of coconut milk, flip them upside down so you can scoop out the coconut cream. Separate the water and add the coconut cream to a bowl with the powdered sugar and beat on high setting for 4-5 minutes. Once the coconut cream is light and fluffy, add the vanilla extract and beat for another minute. <–this stuff is heaven-sent..feel free to hang out here for a bit and savor every finger lick! 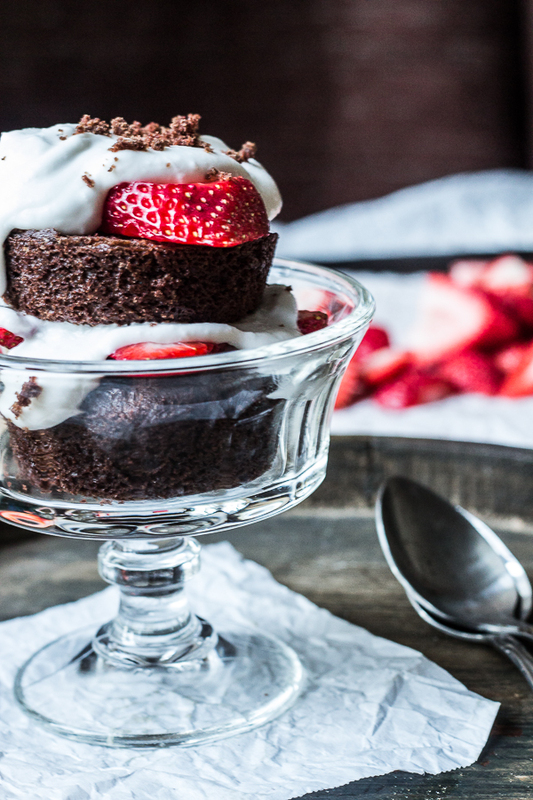 What I reealllly love about this chocolate shortcake is its mild chocolate flavor – not overpowering at all. I got a little crazy with the coconut cream, I don’t mind telling you. My mind kept telling me it was regular frosting but I knew it wasn’t, and I wanted to keep eating more of it. I’m a big frosting lover and now I’m pretty sure this is the only frosting I’m rocking from now on. Vegan high-five!! Preheat an oven to 350 degrees. 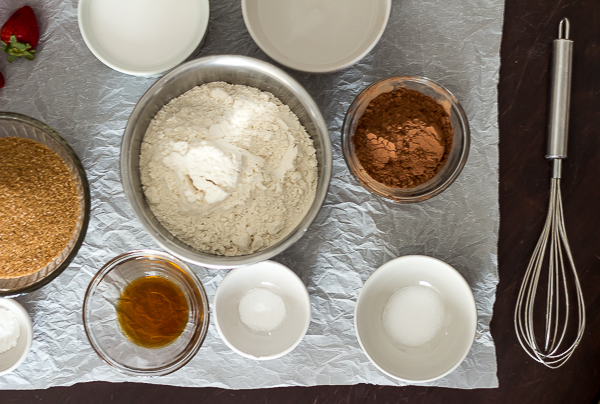 Combine the flour and all of the dry ingredients and sift together in a bowl. In a separate large mixing bowl, stir together the coconut milk, water and vinegar until it has completely curdled then add the remaining ingredients (sugar, oil, vanilla extract). Whisk the flour mixture into the wet ingredients slowly. Beat for one minute, then divide the batter into 3 the prepped cake pans lined with parchment paper or sprayed cup cake pans. 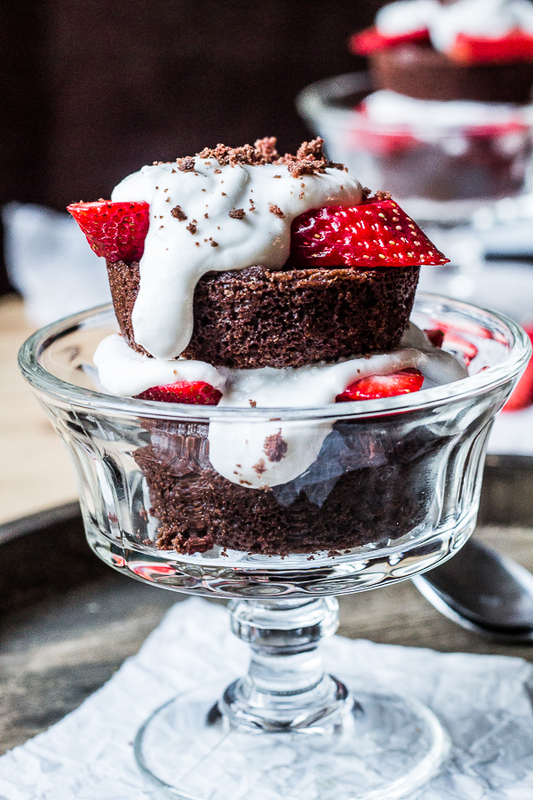 Bake the chocolate shortcake for 20-22 minutes if using 8-inch back pans or 10-15 minutes if using the cup cake pans. Bake until a toothpick inserted comes out clean. Allow cakes to cool on cooling rack for 10 minutes then invert onto the cooling racks. Make sure cakes completely cool. Can take up to 20 minutes to cool completely. Make sure the coconut milk has been refrigerated for 4 hours or overnight. Flip the cans of coconut milk over and cut open the cans using a can opener. Scoop out only the dense coconut cream and set aside the remaining liquid. Combine coconut cream and powdered sugar in a large mixing bowl. Beat on high 3-5 minutes keeping an eye on the cream, until it becomes fluffy and light. Then whip the vanilla extract into coconut cream for 1 minute. Use a cookie cutter around 3-4 inches in diameter and cut out 2 small cakes for each serving if using 8-inch cake pans. 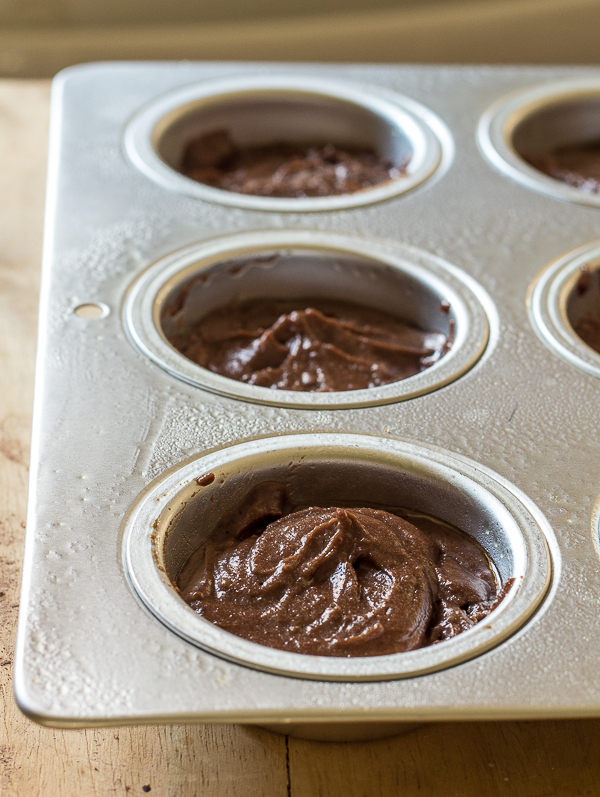 If using cup cake pan, slice off the tops of each cupcake so that the tops are flat. Layer the short cake with the coconut cream, strawberries, then shortcake, coconut cream and strawberries. Can garnish with flakes of chocolate or drizzle of chocolate sauce.